IF JANE AUSTEN WAS A TEXAN . . . If Jane Austen was a Texan, she woulda have born in Kerrville in 1775, ‘bout the same distance n DI-rection to Austin as Steventon was from London. Her pappy woulda bin a Southern Baptist minister, havin’ studied up in Abilene in the seminary – agin, the same distance n DI-rection from Kerrville as Steventon is from Oxford. It woulda open wit the line famous in Texas lore, “Ít is the gawd dang awful thruth that a rancher who is unhitched, wit lots a cattle, is hankerin’ for a missus who’ll fixin him breakfast wit grits, eggs and steak”. Her utter books were includin Sance ‘n Sance’bilty, Mansfield Ranch, Emmer, Pur’shay’un n Northunger Alley. Her utter brudder, Edward was captured by the Choctaw injuns. They adopted him and made him a blood brave in the tribe. Since he was a brave now, he changed his name to Knight – havin’ once red King Arthur’s Court. He soon convinced them to grow cotton rather than a goen’ on the warpath all the time. (As they say in Texas, ‘He was in tall cotton!’) He soon became rich, so much so that he settled Janie, Cassie and her Ma and their friend, Martha in a little ole cabin on the Guadalupe River jist outside ‘a Spring Branch. He named it Chawton Cottage, takin on aires with an Englishfied name. 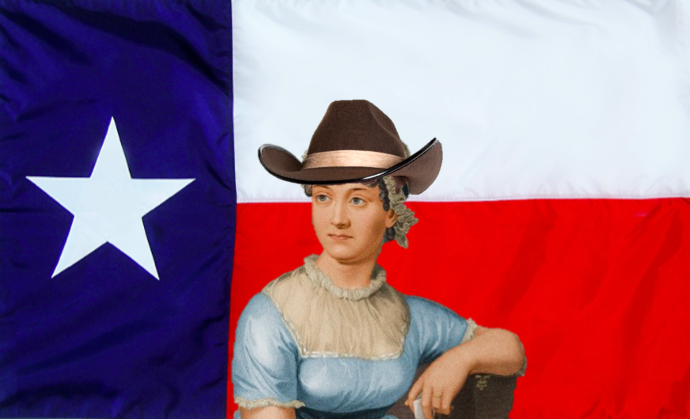 Jane Austen was a true daughter of the Republic of TEXAS. The geographic center of the members, called the “Jane Austen Centre,” is approximately located in Southwest Austin at the Lady Bird Johnson Wild Flower Center. 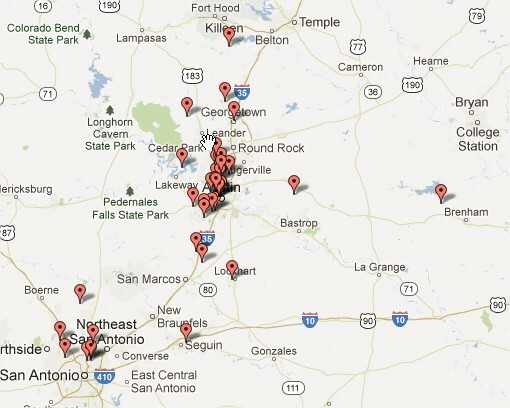 Please click on the link for an interactive map: Interactive Map. Have fun!